Thanks for the feature in the group, "Breathtaking Gardens and Landscapes"! Thanks for the feature in the group, "Dimensions"! Beautifully capture and presented, Cheryl! 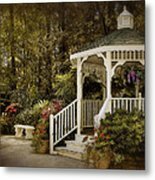 Love the serenity that this piece exudes, and the colors with the white rally make it extra special, and the white bench, complimenting the gazebo is very nicely composed. Great job on this beauty! Thank you, Randy! I appreciate you taking the time to comment on my image! 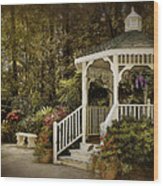 Thanks for the feature in the group, "3 A Day Greeting Cards for All Occasions"! So beautiful Cheryl! I love this! 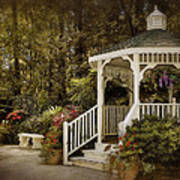 A very romantic garden setting with a white gazebo, decorated with beautiful flowers and greenery. 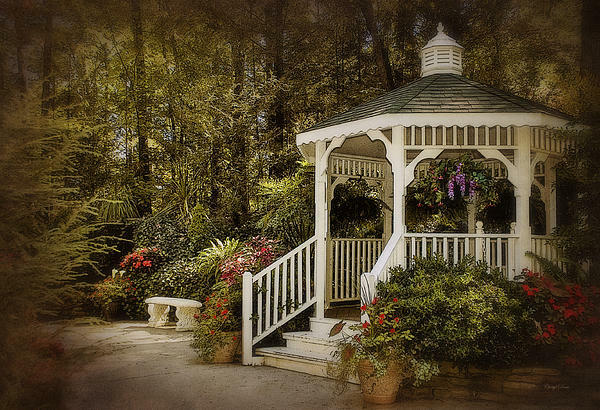 Textures and treatments have been added to image for an artistic look.